Bacteria and fungus will grab any surface they can to survive and thrive. Dentures of all varieties are no exception. Whether it’s metal or plastic, calculus (tartar) will collect and fungus will grow. The most effective weapon we have against these microbes is a tooth brush . Physically wiping the surface of the denture, removes the “bio burden” off. The bio burden does not only consist of the microbes, but the proteins and other products that are found in saliva. These salivary products form a sticky mass that adheres to the denture. Products from foods and cigarettes also adhere to this mass and stains then appear on the dentures. Certain bacteria also create odours. Cleaning this material off is therefore important to the health of the mouth. It reduces the incidence of decay on the teeth and fungal infections on the mucosa and the gums. Ulcers are also less likely to occur. As a bonus you will look, smell and feel better! The simplest method of cleaning is with a toothbrush and a small amount of toothpaste. Wipe the denture base, the teeth and its under surface firmly. 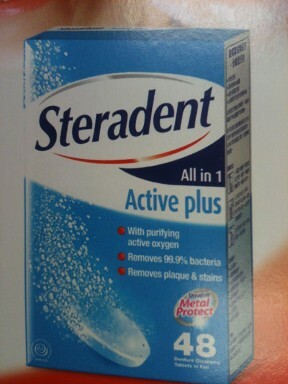 Steradent tablets dissolved in water also help clean the denture chemically, once it has been physically cleaned. It contains Citric acid, sodium bicarbonate, and other ingredients that help prevent the formation of tartar. Steradent tablets, also release oxygen radical bubbles, that claim to eliminates 99.9% of bacteria as well as dental plaque and discolouration. 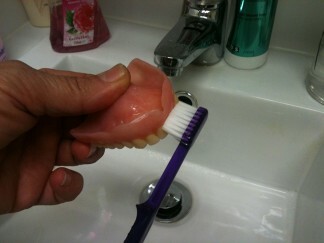 Leave dentures in solution for 3 to 10 minutes to take effect. 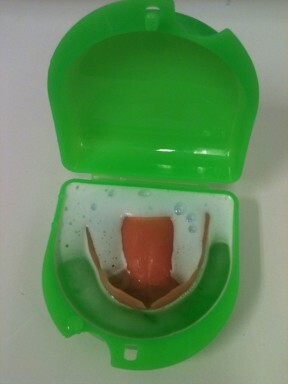 Then remove from the solution and rinse the dentures under running water before placing them back in the mouth. Steradent cleaners do not corrode metal components of dentures. 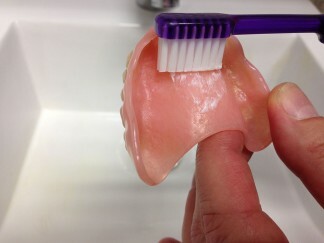 With Valplast dentures, different cleaning instructions are necessary. The Valclean powder is concentrated so only a small amount is need each time. A Valclean box contains 10 sachets thus the whole box should last 6 to 7 months. The cost of a box is $70 and includes postage and handling. Please e-mail an order to info@seymourdental.com.au. Dentures need to be left in water so as to not dry out. This is especially so for acrylic dentures. 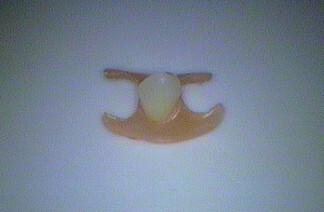 The denture may warp if it is thin. Acrylic dentures are designed to absorb some moisture, so if the denture is thin it may warp. Dentures are not set it and forget it. They also need tender loving care for the sake of your health. Next week: The start of a week in the life of a dental student!